The School’s Curriculum Goal is “to provide all students with the appropriate qualifications, skills and values to equip them for life”. At the heart of the Darrick Wood School curriculum is the National Curriculum. This is designed to enable all students to respond positively to the opportunities and challenges of the rapidly changing world in which they live. Students should leave school having become successful learners, confident individuals and responsible citizens. The NC establishes a coherent framework to promote study, building on previous learning and becoming more demanding as students move through the School. The Darrick Wood School curriculum has two broad aims. To provide students with the opportunities to learn and achieve. To prepare students for the responsibilities and experiences of life. In achieving these aims the curriculum should provide appropriate challenges for all students in ways which satisfy the diversity of their needs (including those in the Deaf Centre), so that opportunities for their inclusion in mainstream lessons are maximised. To find out more about the curriculum at Darrick Wood School, please contact the office: office@darrickwood.bromley.sch.uk. At Darrick Wood, subjects are grouped into Departments and Faculties. To find out more about the subjects taught in each faculty please select from the menu below. In KS3, pupils are taught in ability bands after they are set in October of Year 7. There are three broad ability bands in Years 7 and 8, and four in Year 9. What do pupils learn in KS3? All pupils will study for the same examinations, although texts studied will vary according to ability. Options for Literature include Great Expectations, Jekyll and Hyde, A Christmas Carol, Lord of the Flies and Anita and Me, to name but a few ! Shakespeare is studied, along with a collection of themed poetry – ‘ Conflict’ is the most popular current choice here. Both GCSEs are examined at the end of Year 11 ; there are no controlled assessments. Edexcel A Level English Literature. Students study, amongst other texts, Shakespeare, A Streetcar Named Desire, Romantic or Metaphysical Poetry, and at the moment a grouping of Science Fiction novels, including the seminal Frankenstein. While 80% of the A Level is assessed by formal examination, coursework covers 20%, and for this option students choose questions for a range of partly self-selected texts. Media Studies is taught in two classrooms, both of which are fully equipped with audio visual equipment as well as laptop and Apple Macintosh computers. A dedicated editing suite is also on site for Sixth Form students to use. In addition to the teaching staff, we have two part-time technicians to guide students. Students in Years 10 and 11 currently follow the AQA syllabus. This is assessed both by coursework (60% weighting) and externally set examination (40%). Students are required to undertake two pre-production assignments as well as a practical production task. The topic for the examination changes every year. Students in Years 12 and 13 currently follow the AQA AS and A2 specification. The full A Level comprises of four units, with equal weighting given to coursework and external assessment. Students learn how to analyse media texts and take a critical look at aspects of the modern media landscape across three platforms (broadcast, print and e-media). In KS3 the art curriculum is focussed on developing pupils’ artistic skills in drawing, painting, photography, printmaking and sculpture. Pupils study the lives and works of many artists to see how and why they make art. Pupils work on thematic projects (e.g. Power). Pupils learn how to develop their own individual projects based on observational drawing and artists’ research. Pupils develop their visual, verbal and written communication skills. Students will work in analogue and digital photography, developing their use of lens-based media through artistic methods. They will advance their technical and creative skills, learning and experimenting with a range of techniques such as creative lighting, darkroom practice, image editing and use of mixed media for their photographic artwork. Students will learn how to develop a project on a chosen theme, for which sketchbook skills, analysis of artists’ work and written annotations are very important. Student projects and examination pieces will be exhibited at the end of the academic year, showcasing their strongest work. Pupils are taught on a rotational system with the other Design and Technology subjects. They have approximately 20 one-hour lessons each year, most of a practical nature. Groups are mixed in ability. At GCSE level we offer Eduqas Food Preparation and Nutrition. The syllabus covers Food Commodities, Principles of Nutrition, Diet and good Health, Food Sciene, Food Provenance and practical food preparation skills. The Catering course covers commodities, nutrition and menu planning. There are two practical examinations of two hours and a theory paper. The coursework for Hospitality involves working in a group to plan and cater for an event of the pupils’ choice and there is a theory paper. Pupils will wear “chefs whites” for their practical sessions. WJEC Level 3 Food Science – from September 2017. This course consists of 3 units. Meeting the nutritional needs of specific groups. Ensuring food is safe to eat. Experimenting to solve food production problems or 4 Current issues in food science and nutrition. Key Stage 3 Design and Technology is taught in rotations. Pupils spend approximately 12 weeks in each material area. In addition, pupils will also study designing and making principles, including a broad range of design processes, materials techniques and equipment. They will also have the opportunity to study specialist technical principles in greater depth. In order to be successful in this subject you need to be able to manipulate materials confidently. This practical, work-related course will enable you to learn more about the practical side of the subject. It enables learners to work in a hands on way to develop the core skills needed to manufacture products in their area of interest. There will also gain an insight to potential career opportunities within this sector. Pupils who complete the course will achieve either a Level 2 Distinction*, Distinction, Merit or Pass, equivalent to GCSE passes from 5 - 9 or a Level 1 Credit, equivalent to a GCSE grade 1 – 4. Unit 1: Skills Demonstration (30%) – pupils will undertake a number of mini projects that will allow them to be assessed against 12 practical skills. Unit 2: Extended Making Project (30%) - pupils will undertake an extended making project that will showcase the skill they have developed in unit 1 and draw on the knowledge gained in unit 3. Section A of the paper comprises 20 multiple choice questions. We offer a broad based 3D Design course covering all aspects of the design process. Throughout the course we look at Graphics, Computer Aided Design and Manufacture, Theory of Design, Design History, Materials etc., leading to a portfolio of coursework during Year 12. During Year 13 student do an extended project that is of the student’s choice (in an area of their interest e.g. Product Design / Interior Design / Architectural). This will lead to a single design and make project that will account for approximately 60 hours of the course. AQA GCSE Design and Technology: Textiles is offered at Key Stage 4. Pupils learn in more depth about the textiles industry and skills for designing and making and then carry out a major project which results in a finished product. A 2 hour exam is also completed. Pupils develop a wide range of practical making skills incorporating surface embellishment, joining and finishing, combining materials and colouring fabric. In year 10 and 11, pupils complete an assessment of 12 core skills and complete an extended making project. The technical award is equivalent to 1 GCSE. 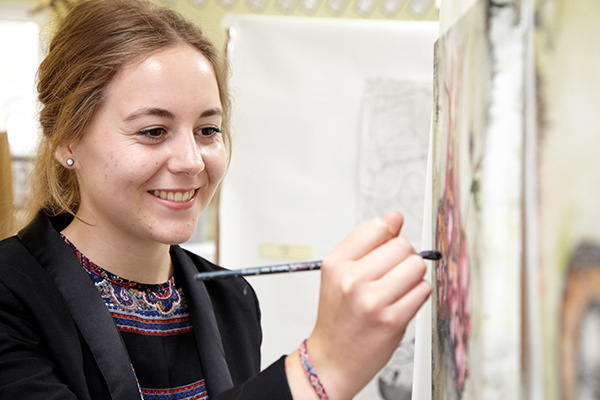 We offer a Level 3 BTEC Art & Design (Textiles) course in the sixth form. In Year 12 students work towards the Certificate, which is equivalent to an AS qualification. In Year 13 students continue towards a Diploma, equivalent to one A Level. Units studied include: visual recording, communication through Art and Design and materials and processes. Pupils are taught in mixed ability tutor groups in Year 7 and are put into sets for Years 8 and 9. Geographical skills are taught throughout the units. These include; map skills, interpreting graphs, tables, photographs, diagrams, extended writing and essay writing. Pupils follow the Edexcel B specification. The units studied give pupils a sound understanding of important physical processes such as coastal processes with an overview of the UK’s geology, river processes and the hydrological cycle. Hazardous earth including volcanoes and earthquakes, ecosystems and forests under threat. These topics are interlinked and although they may study them separately the unit is designed to show them how physical geography combines to create a ‘life support system’ for the planet. They also focus on human geography at a variety of scales. Pupils will study how populations grow and change, the challenges of an urbanising world as well as changing UK cities. Where people live and work, and how they exploit and use resources. The compulsory topics will introduce pupils to the main aspects of how people live on our planet and the impact they have. Pupils also develop their geographical skills further including; interpreting maps and graphs, fieldwork and mathematical skills. Pupils complete at least 2 days of fieldwork, one in a human and one in a physical environment. In Year 12 A Level candidates study the Edexcel specification, designed to be compatible with GCSE work and reflecting modern approaches to the subject. Physical Geography topics include; Hazardous earth, Coasts, the Carbon and Water Cycle as well as water security. Human geography topics include; Globalisation, Regeneration and Superpowers. There is also an important fieldwork aspect in which the pupils are given the opportunity to take part in a residential field trip to Dorset. Here they look at both physical and human fieldwork techniques and complete an independent investigation looking more closely into something that interests them. Pupils in Year 7 study History in their mixed ability tutor groups. At the end of Year 7 the students are put into sets. The decision to put a pupil into a particular set is made as a result of both teacher judgement and their STEPs assessment level. Students are formally and informally assessed regularly throughout KS3. The progress of all students is reviewed every term and the sets are adjusted accordingly. Pupils study History twice a week in Years 7 and 9 and once a week in Year 8. Pupils opting for the subject in Years 10 and 11 follow the Edexcel GCSE syllabus. They will study the Cold War, Medicine through time, Weimar and Nazi Germany and Richard I and King John during the two years. The students follow the Edexcel A Level History specification. The students study examined units on Chinese, Russian & British History. In year 12 they look at Communism in the Soviet Union and Mao’s China. In year 13 they study rebellions during the Tudor period. They will also be expected to produce a coursework assignment. At AS level candidates will develop a broad knowledge and understanding of key aspects of the core areas of psychology - social, cognitive, developmental, biological and individual differences. At A2 level the specification offers a range of topics chosen for their relevance, accessibility and popularity. These options bring together explanations from different psychological approaches and students address issues and debates in contemporary psychology. By studying both psychological research and scientific methodology students gain a broad range of skills which prepare them for higher education or a wide range of potential careers. Pupils are taught in mixed ability classes and follow the Bromley Agreed Syllabus. They have one hour a week (5% of curriculum time) and Christianity is the main religion taught. In years 7 and 8 pupils are taught from a thematic approach. In year 9 pupils look at Philosophy and Ethics before starting their GCSE course in January. Most pupils will study Religious Studies in both Years 10 and 11 as part of the core curriculum and will take GCSE examinations at the end of Year 11. Students follow the OCR syllabus and study courses in ethics and philosophy. In ethics, students study a combination of ethical theories and their application to topical issues. In philosophy, students study some of life’s basic questions and answer them through past and present philosophical thought. Pupils opting for the subject in Years 10 and 11 follow the AQA syllabus. The topics studied will include: Studying Society, Education, Families, Crime and Deviance, Mass Media, Power and Social Inequality which are examined at the end of Year 11. Unit G671: Exploring Socialisation, Culture and Identity (worth 50% of the AS Level and 25% of the overall A Level). Students are examined in this unit in January of Year 12. Unit G672: Topics in Socialisation, Culture and Identity - Sociology of the Family (worth 50% of the AS Level and 25% of the overall A Level). Students are examined in May of Year 12. Unit G673: Power and Control. Crime and Deviance (worth 25% of the overall A Level). Students are examined in June of Year 13. Unit G674: Exploring Social Inequality and Difference (worth 25% of the overall A Level). Students are examined in June of Year 13. Pupils are taught in mixed ability groups. We cover a range of topics as detailed below. They have one lesson per week. We make use of a range of resources to provide an interesting and stimulating approach to learning about the use of technology, such as interactive content on the school online learning platform. We see ICT as a tool that we need to learn how to use effectively. 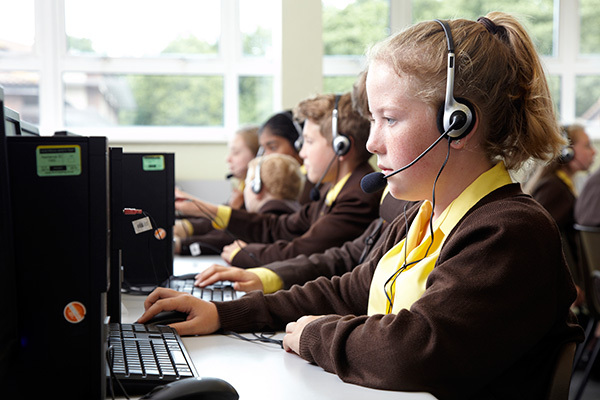 Pupils follow the European Computer Driving Licence (ECDL) offered by the British Computer Society (BCS) which covers the key concepts of computing, its practical applications and their use in the workplace and society. There are three Modules: Spreadsheets, Word Processing and Presentations, which build upon pupils’ prior skills and knowledge to enable competence in more advanced utilities. The fourth Module, Productivity in IT, develops the pupil’s ability to plan, evaluate and improve procedures involving the use of IT tools and systems in order to improve the productivity and efficiency of work. Assessment is made through a set of four separate examinations – one for each unit. Assessment is primarily by portfolio assessment which is internally assessed but externally moderated. Each portfolio consists of smaller projects which are produced throughout the year allowing for informal assessment on a frequent basis. One unit is assessed through an external examination. The course gives students a wide choice of progression routes into further study, training or relevant employment in ICT. Students may move on to degrees or employment in areas such as computer science, multimedia, e-business and information management, information systems, software development and website design. There are two levels to the course. In year one students work towards the Certificate, which is an equivalent to an AS qualification. In year two students continue towards a Subsidiary Diploma, broadly equivalent to one A Level. The course comprises discrete units, three per year. Darrick Wood School supports pupils with Special Educational Needs with regard to the Special Educational Needs Code of Practice first published on 11th June 2014 and last updated on 1st May 2015. Principles underpinning the code of practice are observed as closely as possible. The Head of the Learning Support Faculty and SENCO is Mrs J. Lancaster. It must be noted that Darrick Wood School does not have a special unit for SEND pupils. In addition, the school is guided by the Banded Funding Guide (Bromley Inclusion Support Service). Statemented pupils have a recognised diagnosis or a set of complex needs which have been formally assessed. In the course of time, as deemed necessary by the local authority, the Statement will be transferred to an EHCP (Education, Health and Care Plan). Pupils designated as SEND are added to the school Focus List and are identified as K (SEND Support). This is a confidential document shared with staff so that they are aware of the special educational needs of the pupils. This is a service which is dependent upon the pupils needs and corresponding funding. LSA support within the classroom is designed to enable the pupil to access the curriculum at the appropriate level and also to maximise independence in a learning environment. Special examination arrangements can be applied for based on current regulations determined by the Examination Boards. At Darrick Wood School the pupils in Years 7, 8 and 9 follow a course of study which follows the Mathematics Strand of the Key Stage 3 National Strategy. This builds on the achievements and experiences of the primary curriculum and allows pupils to enjoy a smooth transition from primary to secondary school Mathematics. Pupils are taught in sets based on their ability. This allows teachers to personalise their individual learning needs and ensures that they have a clear pathway through the curriculum. Learning is supported by using the Framework Maths textbooks. Lessons are differentiated to match different learning styles and teachers are aware of any Special Education Needs of pupils within their classes. Assessment in Key Stage 3 consists of a weekly comment in pupil’s exercise book, half termly tests, and a summer examination graded by National Curriculum Level. Assessment criteria are shared with pupils. In Years 10 and 11 pupils follow the EDEXCEL GCSE Mathematics linear specification. A selection of texts are used, these include new GCSE 2010 Higher and Foundation texts. Pupils are set according to their ability, progress in Years 7, 8 & 9 and their end of Key Stage 3 test results. The more able pupils will also have an opportunity to take a FSMQ in Additional Mathematics. Students study for Mathematics at AS and A2 Level. Very able mathematicians also have the opportunity to study Further Mathematics. The specification we follow is AQA Mathematics, which comprises of six modules. Three modules are studied in Year 12 and a further three in Year 13. The course includes Pure Mathematics, Statistics and Mechanics. The French Department is an integral part of the Modern languages, which is situated on the top floor of the Barker Building. Pupils in the X half of Year 7 learn French from Year 7 onwards. Those in the Y half take up French in Year 8 and continue with it into Year 9. Languages are an extremely important part of the School’s curriculum and we recommend that as many pupils as possible study French, German or Spanish to GCSE level at least. A good number of pupils continue with two languages in Year 10 and 11. Learning a language develops a pupil’s aural and oral skills, aids literacy and increases their confidence. Languages are fun and beneficial for travel, future studies and enhancing job opportunities. Several universities have now made a language at GCSE a prerequisite for entry. Modern Language students now use the School’s new Internet link with video conferencing to aid them with their work and to communicate live with pupils in other local Schools. We have extended the use of the Internet and IT in lessons with the purchase of some innovative and interactive resources as well as subscriptions to language websites which enable pupils and students to work independently. 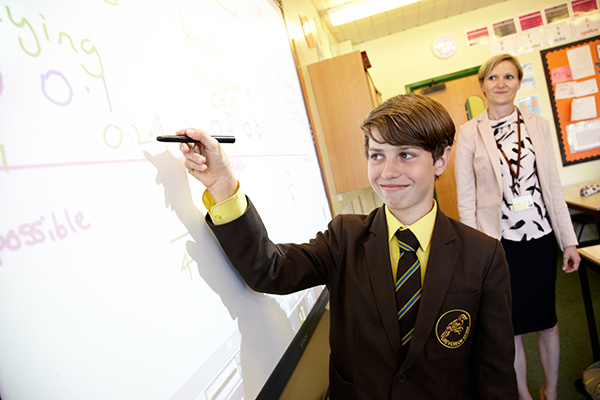 Electronic white boards are used in all MFL lessons and we have access to laptops for use in class when required. Pupils follow the National Curriculum areas of experience using Équipe Nouvelle books 1, 2 and 3. All pupils are asked to purchase a language dictionary by Christmas of Year 7 as these are a useful aid with homework and independent learning throughout the pupil’s career of language learning. The textbooks introduce a lively and fun approach to learning a modern foreign language and place a great deal of emphasis on authentic listening, speaking, reading and writing skills. The courses consist of textbooks, sound recordings, worksheets, regular assessments, DVDs and language games. We use “Boardworks” as well as several other web-based packages on the interactive whiteboards to compliment the learning and teaching of MFL. Topics covered include Self and Family, hobbies, school, health and fitness, the local area, learning about France and its different regions, French festivals and traditions, transport and the environment. Pupils in 9X sets 1 to 3 have the opportunity to sit the ASSET Languages examination in the Summer Term, which qualifies them for an award equivalent to a grade D to G at GCSE. We have had huge success over the past two years with pupils’ results. Pupils who opt for GCSE French study the language for two years and take the GCSE examination in Year 11. All sets currently follow the AQA linear specification and 30% of the total mark is calculated from their controlled writing tasks with 30% assigned to their speaking tasks. These are completed over the two years. The GCSE examination emphasises the importance of authentic materials. The course used is Expo for French. All students also have supplementary lessons with the French Assistant. Revision lessons are arranged at Easter and prior to the mock and final examinations. Self and family, Leisure, Home and environment, Work and Education, Tourism and Life Style. In the Sixth Form students may study Edexcel AS/A2. This involves a detailed study of the language and the ability to converse fluently. The areas studied for AS are Lifestyle Health and Fitness, Youth Culture and Concerns, the World around us, Education and Employment. The Foreign Language Assistant holds extra lessons with small groups of students to help them to prepare for their Oral examination. We attend The Philip Alan Update lectures in London to enhance their skills and we encourage our students to make use of the Intitut Français in London and watch French films for pleasure. All students are strongly advised to spend time abroad to improve the fluency of the language they are studying. Visits Abroad - Year 8 pupils are offered the chance of spending a day in Le Touquet in Northern France. They have a series of tasks to fulfil, such as using French to ask the way, obtain information from the Syndicat d’Initiative, buying drinks, cakes, ice creams, etc. All pupils are issued with a booklet with points for guidance and they explore the town by means of the various tasks set. For Years 10 to 13 there is a 4-day trip to Paris and Disneyland during the October Half-Term holiday. We continue to offer a day trip to the Lille Christmas Market for Years 10 to 13 also in December. We also aim to take the Year 12 and 13 French students to Paris in March for a weekend study break. The Library - The school library has a wide selection of magazines and films on DVD in French and German. There are also self study materials for Sixth Formers in the Resource Centre. Languages are playing an increasingly important role in the everyday lives of British people, most especially in the worlds of business, tourism and of course education. Consequently at Darrick wood School modern foreign languages are at the heart of the curriculum at Key Stages 3 and 4 and are an increasingly popular option in the Sixth Form. The German department is a cornerstone of the MFL Faculty. It is situated in a suite of modern, attractive and well-resourced classrooms on the top corridor of the Barker Building. An ICT suite is also situated on the corridor and the Department has at its disposal a mobile laptop trolley for extra access to ICT facilities within regular classrooms. In addition to the specialist teaching staff the German Department is proud to welcome a native German speaker to the Department each year to assist with the linguistic and cultural development of pupils and students. One half of the pupils in Year 7 starts learning German as their first modern foreign language for two lessons per week. Initially pupils are taught in mixed ability tutor groups. Based on the results of the first common assessment, performance in class and for homework, pupils are placed in ability sets, although movements will occur following further assessments. At the beginning of Year 8, those pupils who had started learning German in Year 7 continue to learn it for two lessons a week. From those that had begun with French in Year 7 four ability sets of pupils will also learn German for three lessons every two weeks, following an accelerated course. In year 9 pupils will continue learning for two lessons a week. In June of Year 9 pupils in sets 1-3 who have been learning German since Year 7 will sit examinations towards the Asset languages qualification. Languages are playing an increasingly important role in the everyday lives of British people, most especially in the worlds of business, tourism and of course education. Consequently at Darrick Wood School modern foreign languages are at the heart of the curriculum at Key Stages 3 and 4 and are an increasingly popular option in the Sixth Form. 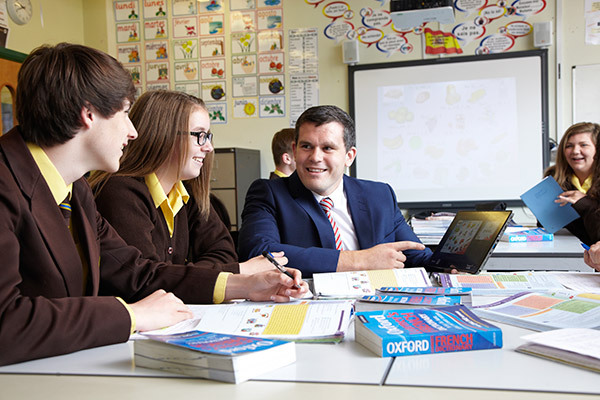 The Spanish Department is a relative newcomer to the MFL Faculty, having been introduced five years ago as a Beginners’ GCSE and introduced into the Key Stage 3 curriculum as recently as 2009-2010. It is situated in a suite of modern, attractive and well-resourced classrooms on the top corridor of the Barker Building. An ICT suite is also situated on the corridor and the Department has at its disposal a mobile laptop trolley for extra access to ICT facilities within regular classrooms. In addition to the teaching staff the Spanish Department is proud to welcome a native Spanish speaker to the Department each year to assist with the linguistic and cultural development of pupils and students. At the end of Year 7, those pupils in sets 1 and 2 for French and German are given the opportunity to choose Spanish as their second Modern Foreign Language - from the beginning of Year 8, those pupils will learn Spanish for three lessons every two weeks. In year 9 pupils will continue learning Spanish but for two lessons a week. There is currently no provision for Spanish at AS or A2 level at Darrick Wood School. Dance is taught as part of the extra curricular programme at KS3 level and within Physical Education lessons. The Drama Department also teaches a Scheme of Work using movement and dance as part of its Shakespearian work. AQA GCSE Dance. Pupils opting for GCSE Dance study an eclectic mix of dance genres and choreographers. Work undertaken is complimented and informed by frequent visits to the theatre to see live, professional dance works. Pupils learn how to perform, compose and appreciate dance through practical and theory-based lessons. Dance is studied at AS and A2 Level (AQA) and forms part of the AS/A2 performance studies course (OCR). Students study a diverse range of dance styles from contact improvisation to African and practical work is informed through academic study of professional dance works and the contexts from which they derive. Students are taught to develop their compositional, performance and appreciation skills and are taught to consider the social/historical relevance of the works studied. Studies are supported by lessons which explore the role of the dancing body, its anatomy and physiology as well as the physical and psychological limitations on the body. 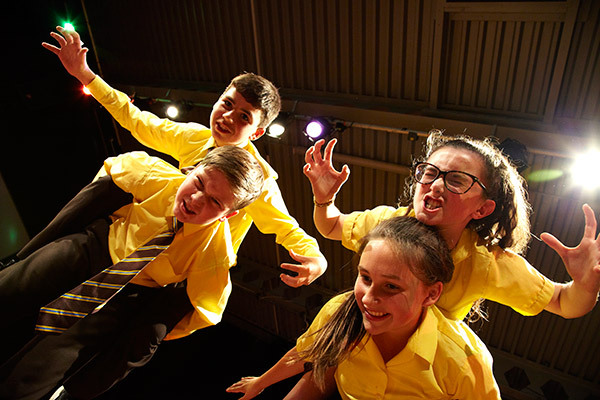 KS3 Drama lessons are divided into modules and aim to develop the pupils' theatre skills as well as giving them the opportunity to grow in understanding of themselves and the world around them. At the end of each term, pupils carry out a practical assessment as well as a formal practical examination at the end of the academic year; this enables teachers to gauge the individual pupils’ progress. Pupils are taught in their mixed ability forms. Pupils study EDUQAS GCSE Drama. A large amount of the work will be practical and will include: devising drama, texts in practice, technical workshops, mime, movement, voice and speech work. The scheme of assessment comprises 60% practical work and 40% written examination. The practical work consists of a devised piece and a portfolio that is internally assessed and externally moderated. As well as the performance of two scripted extracts which is externally assessed. The written examination consists of two sections that explore their understanding of drama, exploration of a set play studied and the work of theatre makers in a live production seen. Visits to the theatre both locally and in London are an important and enjoyable part of the course. We also aim to offer pupils the experience of professional theatre workshops at some point during the course. Drama and Theatre follows the EDEXCEL Specification and is a natural progression from GCSE Drama. This course encompasses both theoretical and practical aspects of Drama and gives students a good balance between physical performance and academic written work. The scheme of assessment comprises 60% practical work and 40% written examination. This course is firmly rooted in creativity, sensitivity and the development of critical and communication skills. It is designed for students who want a deeper understanding of drama and are interested in studying plays, looking at the work of influential theatre practitioners, analysing live theatre performance and creating performance work of their own. In Music lessons the three integrated areas of listening, performing and composing provide the focus of all curriculum activities. Key Stage 3 lessons involve the use of the very latest music software to assist pupil learning in all areas of the topics covered. The department has a dedicated Music ICT area that has been purpose built to meet the needs of all who study Music. Extra-curricular activities flourish, all students are actively encouraged to become involved in the many instrumental and vocal ensembles that run every lunchtime. Many of our students learn music from the large team of Bromley Youth Music Trust appointed peripatetic staff. Year 7 and 8 are set into ability groups after an initial half term assessment. Pupils follow a programme of physical activities which suit their ability levels. Each activity pupils participate in will be carried out for a duration of 4 weeks. Activities include football, netball, basketball, gymnastics, fitness, hockey, trampolining, swimming, handball, cricket, rounders and athletics. In Year 9 the curriculum is personalised to suit the strengths of each individual with pupils allocated to a pathway which will enhance their learning. These include male games, female games, mixed games, creative, mind & body and alternative. Within these lessons pupils could be doing similar sports but with more of a leadership focus. Other sports they may compete in are yoga, badminton, aerobics and cheerleading. From Year 10, we offer the opportunity for pupils to choose a GCSE in Physical Education (AQA) or to follow a BTEC Sport qualification. 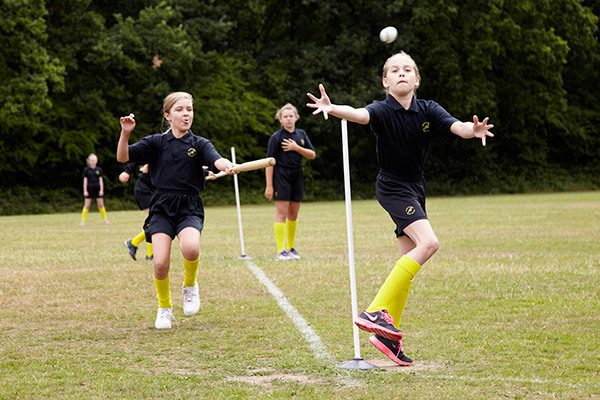 All pupils also receive one hour of Core Physical Education a week during which pupils have a lot more scope to choose their own activities in which to participate. AQA A Level Physical Education is offered as well as BTEC National Level 3 in Sport Extended Certificate (EdExcel). At KS3, pupils are taught Biology as a distinct subject covering topics such as cells, digestion and respiration. Pupils are taught in sets according to their ability. Frequent assessment allows for pupils to be moved between different sets if necessary. Biology is taught as part of the Core and Additional Science GCSEs as well as separately as one of the Triple Sciences. We follow the AQA specification. Pupils learn about the nervous system, evolution, adaptation and competition, cell division, inheritance of genetic disease, photosynthesis, respiration and digestion, amongst other topics. Biology: Cells, diffusion, mitosis, the mammalian heart, gas exchange, biochemistry, conservation and classification, DNA and inherited disease, photosynthesis, respiration, excretion and animal behaviour. Students are examined by two written papers at AS level and two at A2 level. A practical examination for both AS and A2 is a large part of the final assessment. When pupils first enter the School they go through a brief programme introducing them to the laboratories and basic safety procedures before embarking on their Key Stage 3 Science course studying a diverse range of topics centred on Biology, Chemistry and Physics. Pupils are taught in ability sets from Year 7 and can change groups as a result of their all-round achievement in classwork, homework, practical studies and tests. The Chemistry studied by pupils is organised in a variety of ways. All topics rely heavily on practical work and draw on everyday experience. Pupils are exposed to many teaching situations, ranging from teacher centred studies to individualised learning. Much emphasis is placed on the understanding, relevance and of course the enjoyment of Chemistry. We believe it is important for children to appreciate the awe and wonder of the natural world. 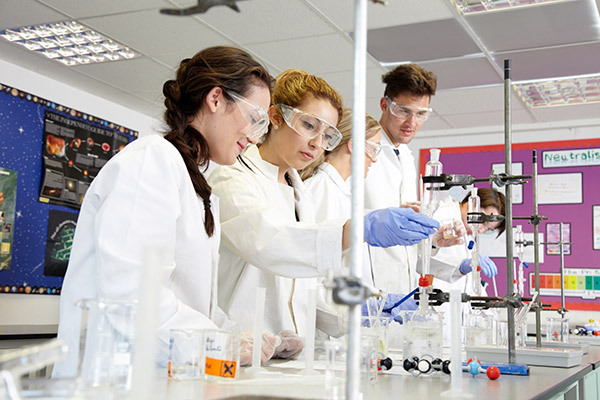 The Science Faculty offers a suite of science courses catering for the needs of all pupils. Chemistry forms a key component of the AQA GCSE Science and AQA GCSE Additional Science. In addition pupils are able to take AQA GCSE Chemistry when choosing to take the Triple GCSE Science option. Key topics include materials, products from crude oil, plant oils, the changing Earth, Structures and bonding, structures and properties, quantitative chemistry, rates of reaction, energy changes, electrolysis, acids, alkalis and salts. In addition pupils studying for GCSE Chemistry will study the Periodic Table, more about acids and bases, water, chemical analysis and more detailed quantitative chemistry. Chemistry also forms a major component of the Edexel BTEC qualification in Applied Science where pupils focus on the applications of chemistry in a vocational context. Atomic structure and chemical reactions, bonding, structure, basic concepts in organic chemistry, hydrocarbons, alcohols, halogenoalkanes, organic analysis, energy transfer in chemical reactions, environmental chemistry, organic acids and amines, polymers and synthesis, rates of reaction, chemical equilibrium, pH, group chemistry, the transition elements and the Mole Concept all taught with an emphasis on practical work and applications that are so relevant to the world of today and tomorrow. From our point of view as teachers we hope the lessons are enjoyable and fun as well as educational! We want pupils to become confident citizens in a technological world, capable of taking an informed interest in its development and to be suitably prepared for employment and/or further studies beyond AS or A level GCE. At KS3, pupils are taught Physics as a distinct subject covering topics such as cells, digestion and respiration. Pupils are taught in sets according to their ability, and frequent assessment, allows for pupils to be moved between different sets if necessary. Physics is taught as part of the Core and Additional Science GCSEs as well as separately as one of the Triple Sciences. We follow the AQA specification. At Key Stage 4, pupils learn about energy and energy resources, Radiation and the Universe, Motion, Work, Electricity and Nuclear Physics, amongst other topics. A Level Physics (OCR Physics B) builds on the foundation work covered in GCSE. The physical principles of energy, forces and motion, waves, materials and electricity are developed with particular emphasis on practical work and application of knowledge and understanding to explain what happens in the real world. The course also covers the most up-to-date developments in atomic and medical physics together with a comprehensive study the solar system and beyond. Although the mathematical content of the new syllabus has been greatly reduced it is important that students have a good basic standard in mathematics. It is therefore recommended that students taking AS/A Physics also consider at least AS Mathematics. Chemistry is the key to many scientific careers and is also highly recommended. Other good combinations include biology, geography and a modern foreign language. Business Studies is a subject which has become increasingly popular in recent years - possibly because of its relevance to modem society with its rapid economic changes. Business Studies is obviously a useful qualification for anyone contemplating a career in business or a business or management course in higher education. It combines well with many other A Level subjects. Darrick Wood’s Business Department has been recognised as one of the best in the South East. Visits include a factory visit-based trip to Europe for Year 13 and a water sports activity day for Year 12 Applied Business A Level students. Guest speakers are invited when appropriate and previous visitors have included a marketing manager from Scottish Courage Breweries and Senior A Level Examiners. Meanwhile, links with local businesses are invaluable in our delivery of the Applied Business course. Health and Social Care is designed to recognise and enhance skills, knowledge and understanding of the health, social care and early years sector including the settings, job roles, principles and values involved. It is a vocational qualification, assessed by coursework only, which contains both theory and practical components. It is useful for anyone who wants to work in the health and social care sector. Students learn a variety of subjects based around health, social care and early years settings e.g. psychology, sociology, science, health and safety, food technology, government initiatives and policies. It prepares students for further training, higher education and moving into employment within the health and social care sector. Career opportunities with a Health and Social Care qualification are: dietician, medical secretary, teacher, nurse, midwife, nursery nurse, doctor, paramedic, occupational therapist, activities organiser, physiotherapist, radiographer, psychologist, police officer, social worker, medical research.